Seriya has been offering Sound Healings 3-4 times a week for many years at The Crystal Castle, the hinterlands of Byron Bay. 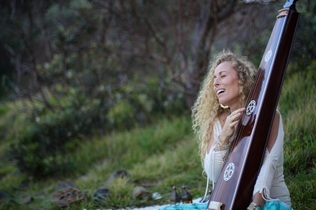 She also offers these in private sessions, events in studios up and down the East Coast of Australia, festivals, and yoga teacher trainings or retreats. Some people have felt pain disappear after many years of disharmony, and others have shared they have felt the "deepest sense of peace, more than they thought possible." If you would like to book Seriya to come to you for a healing session, send her an email. Seriya is so deeply passionate about offering this work she will try to answer any questions and guide you in the right direction wherever needed.